Einstein Bros Bagels was giving a coupon for a free bagel & shmear if you became their fan on Facebook. I gladly took them up on their offer and got my free sesame bagel with onion & chive cream cheese from the Einsteins in Casselberry, FL. Bagels are good. Cream cheese is good. Free is good. What could possibly be bad? I had dinner at the Elephant Bar Restaurant in the Altamonte Mall. I was here a few times in the past and have always enjoyed my food. This particular visit wasn't quite as good. I ordered the Bangkok Pad Thai with Vegetables. For an extra three dollars and change, I had shrimp added to the dish. The Pad Thai looked good when the food arrived, covered in bean sprouts and cilantro. Underneath though, except for a few snow peas, the noodles and other vegetables were overcooked almost to a mush. There were only four small shrimp mixed in, definitely not worth the upcharge. I ate dinner at Pacino's Italian Ristorante on 192 in Kissimmee, FL. I ate here years ago and didn't remember too much about the restaurant. Inside, the restaurant's layout reminded me of a Romano's Macaroni Grill. From what someone I ate with was saying, the interior of the restaurant is very different from what it was in the past. Originally, this place supposedly had a very high ceiling, made to look like you were eating in an outdoor courtyard. They finished the effect with fiber optic fireworks in the ceiling. Now it seems they added a second floor in the space for parties/dinner shows, so the faux outdoor dining is gone. A house salad and some bread came next. For my meal, I had the Linguini Carbonara. It was a huge plate of linguini in alfredo-like cream sauce, mixed with bits of prosciutto. It was a whole lot of cream and pork for one serving, but it was tasty. I have no complaints about the taste although I don't know if I would get it again, just based on it being a bit too much of the same thing. Being located where the restaurant was, just a few miles from Disney and right across the street from Old Town, the prices really weren't all to bad. It seemed to be about equivalent to Olive Garden, only with a better menu. Kyoto Sushi & Grill is one of the newer restaurants to open in the shops surrounding the UCF Arena in Orlando. It is a semi-fast food restaurant, where you order your food with a cashier, and then the food is brought out to your table. I ate here once previously for lunch and had a California Roll. On my second visit, this time for dinner, I had the Hibachi Chicken. Miso soup and salad were served first. The soup was good and the salad had the typical ginger dressing that everyone loves. Besides the unedible chicken bits, I liked Kyoto. The food is mostly tasty, the prices are pretty reasonable (especially for lunch), and the portions are quite large. I think next time I'll either try a bento box or the hibachi shrimp. There are several Chinese take-outs in the various strip malls that surround the Seminole Towne Center mall in Sanford, FL. Out of all of them, China Star is my favorite. They have the tastiest food for the most reasonable prices. On this visit, I ordered a shrimp with black bean sauce combination. It came with wonton soup, fried rice, an egg roll, and the shrimp. The shrimp came in a brown sauce with black beans, carrots, onions, and huge mushrooms, maybe portobello? Mushrooms are one of the few foods I really dislike, so I could have done without them. Besides from picking out the mushrooms, I enjoyed my food! I was told that Palace Pizza has the best pizza in Lakeland. Apparently, this place normally has a huge variety of different types of pizzas available by the slice, and these specialty slices are the thing to get here. The night I visited, there wasn't much left behind the counter and whatever was there looked like it was sitting out far too long. So instead, we ordered a freshly made cheese pizza. I wasn't impressed. Everything was very heavy handed on this pizza. Thick crust, too much sauce, and far too much cheese. There was so much sauce and cheese that by the time I got to my second slice, all crispness was gone from the thick crust and had become limp and waterlogged. Definitely not the NY Style pizza I was expecting after what I had heard about this place. Delano on the Park is located across the street from City Hall in Downtown Lake Mary. I ate here a few times when they first opened, and when I returned on this visit I saw that their name had changed somewhat and they had expanded into the space next-door. I guess business must be good, although I was the only customer when I visited. I ordered the half sandwich/half salad option that they offer. I had half of a turkey sandwich and half of a Mediterranean Salad. The sandwich was pretty basic, with turkey, cheese, lettuce, tomato, mayo, and mustard. The salad had romaine lettuce, onions, tomato, olives, and feta cheese. Both were good and I'd gladly return! Maison Le Grand is a Montreal-based company that produces several types of pestos, sauces, and tapenades. They were kind enough to send me a sampling of their products to try. I suppose it's an unexpected perk of writing a food blog and what you see below is what I cooked with their products along with some thoughts. Since I'm a big fan of pesto, I started by trying their pestos. Pesto and pasta is a classic combination, so I had to give it a try. Here's the Garden Pesto on angel hair pasta with shrimp and cannelloni beans. This pesto was vegan, but the lack of cheese wasn't missed. Out of the three pestos I tried, the Garden Pesto was my personal favorite. Pesto also goes great on sandwiches. Here's my lunch one day consisting of egg, cheese, avocado, spinach, sliced radish, and the 4 Nut & Cheese Pesto on whole wheat bread. I wasn't sure how well the avocado and radish would taste with the pesto, but I actually thought it was a pretty tasty combination. For Maison Le Grand's Sun-Dried Tomato Pesto, I went back to the default pesto and pasta. It was good, but being a person that isn't a huge fan of tomatoes, I preferred the greener pestos. Moving on to other types of sauces, next up is Maison Le Grand's Lemon Confit & Pumpkin Seed Aromatic Sauce. With this, I made a dish consisting of brown rice, garbanzo beans, pickled turnips, onions, and spinach. It ended up having a great citrus flavor. I also found the Lemon Confit & Pumpkin Seed Aromatic Sauce went really well with shrimp. Pictured here is Maison Le Grand's Spicy Olive and Sun Dried Tomato Tapenade on a cracker. I also tried the mild version of the tapenade and decided that the spicy was my favorite. It had a nice kick to it, although the tapenade's spiciness was a bit too much for a few other people that tasted it. Overall, Maison Le Grand definitely has some tasty sauces. I liked just about all of them and the pouches that the sauces come packaged in are just plain cool. I've never seen any other sauces packaged in their type of astronaut food type pouch! If you want to try Maison Le Grand's products, they are available at Whole Foods and The Fresh Market in the Orlando area. Be sure to check out their website, follow them on Twitter, and become their fan on Facebook. Give them a try! I had dessert from Main Street Creamery in Downtown Lakeland. In all of my visits to Lakeland, this was the first time I have ever seen this place open for business. Perhaps they figured it was a good idea to stay open with all of the people looking at the Christmas lights in Munn Park across the street. I had a small Coconut Chocolate Almond ice cream. It was Hershey's brand and was tasty! I received an email asking me to pass along some information about an upcoming Orlando food event. 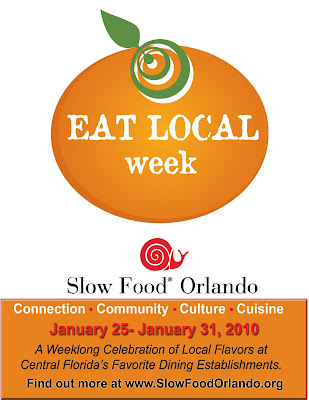 Eat Local Week 2010 is a week long event happening January 25th - 31st. During the week, several Central Florida restaurants will be featuring local foods, meaning it comes from within 200 miles of Orlando. It's always a good thing when restaurants support the local farmers! Be sure to check out their website for more information! I went to see ICE at the Gaylord Palms Hotel in Kissimmee, FL. Pretty cool exhibit where you go into a tent cooled to 9°F and see all sorts of ice carvings and ride down ice slides. After you leaving the freezing temperatures, everyone got a very small complementary cup of hot cocoa. While at the hotel, I bought a dessert from a coffee place called Java Coast. It was in the hotel's gigantic lobby, right next to their re-creation of St. Augustine's Castillo de San Marcos. Their pastries looked good in their display case and I decided to get a Cinnamon Bavarian Twist. The Cinnamon Bavarian Twist had a consistency similar to that of a doughnut. Doughnut wasn't exactly what I was thinking of when I saw the pastry in the case, but it was still tasty. I just wish it had the flaky, crunchy crust that I've had elsewhere with similar desserts.